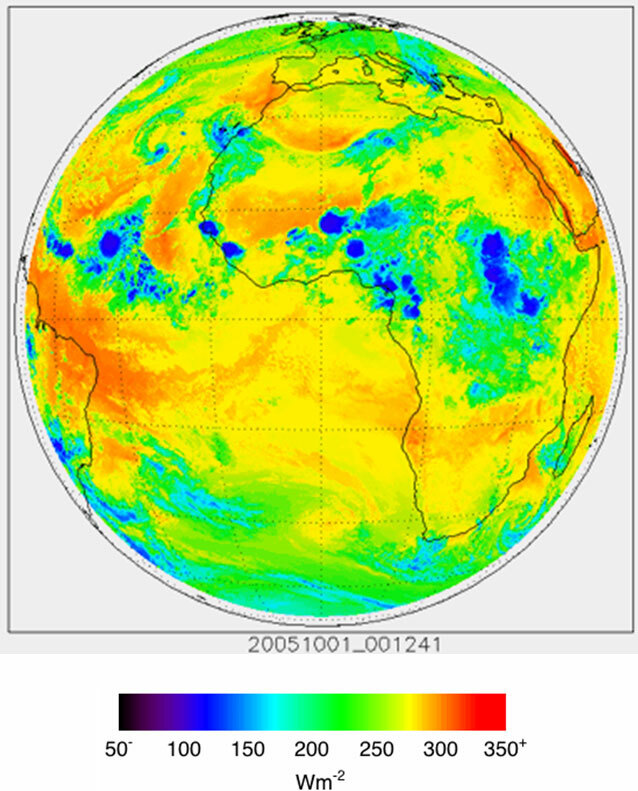 Example of the upward longwave radiation product (W/m**2) as generated by the GOES-R upward longwave radiation algorithm for Meteosat-8 SEVIRI on October 1, 2005, at 00:00 UTC. The upward longwave radiation product is a measure of the total outgoing longwave radiation (OLR) at the top of the atmosphere, and provides important information regarding the Earth’s outgoing energy and overall energy budget at the top of the atmosphere (TOA). It is one of three radiation budget parameters that determine the Earth radiation budget at the TOA. The other two parameters are the incoming solar radiation and the reflected solar radiation. The OLR is estimated directly from several ABI infrared radiances for each ABI pixel, regardless of sky condition. This product, together with the incoming total solar radiation and the reflected solar radiation define the Earth’s radiation budget at the TOA. Understanding of the Earth’s radiation budget is important for climate monitoring purposes.